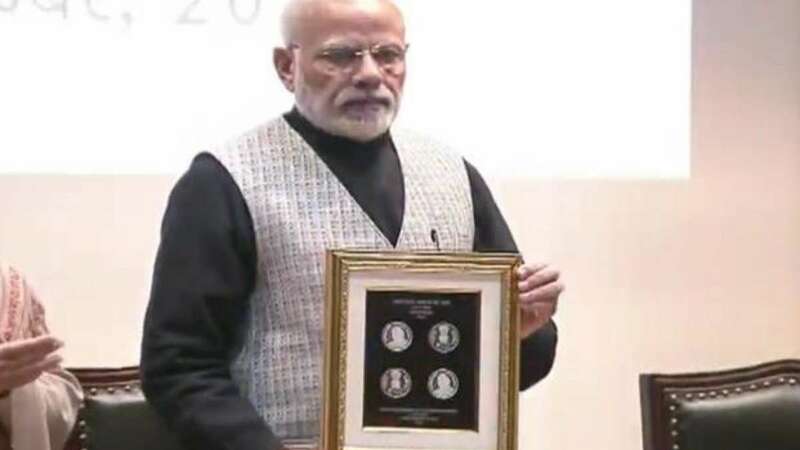 New Delhi : A day ahead of the birth anniversary of former Prime Minister and Bharat Ratna recipient Atal Bihari Vajpayee, PM Narendra Modi on Monday released a commemorative Rs 100 coin in his honour. The coin weighing 35 gm with Vajpayee's image has his name inscribed in Hindi and English. It also has the years 1924 and 2018 inscribed to mark the years of the former Prime Minister's birth and death. On the reverse side, the coin has the Lion Capital of the Ashoka Pillar with "Satyameva Jayate" inscribed below. "For some people, power is oxygen...they can't live without it...A long part of Atalji's career was spent in the opposition benches, but he spoke about national interest and never compromised on the ideology of the party. "I assume that there must have been invitations from other ideologies for joining hands to remain in power. Such things must have happened. But he never compromised. "He was among those who could die for the nation, but would never compromise on the ideology," Modi said. Vajpayee wanted democracy to be supreme. He built the Jana Sangh but when time came to rescue democracy, he and others went to the Janata Party, Modi added. Hailing Vajpayee as "the best orator", Modi said "the mind is not ready to believe that Atalji is no longer with us. He was a stalwart, was loved and respected across all sections of society." Modi said he would be going to Vajpayee's memorial on Tuesday -- his birth anniversary -- to reiterate his commitment to the ideology and path shown by the leader. Commemorative coins are usually issued to celebrate some special occasion or to mark a special event. They also have been issued as a mark of respect towards some distinguished individuals or monuments. Atal Bihari Vajpayee passed away on August 16 at the age of 93 at the All India Institute of Medical Sciences (AIIMS) here following prolonged illness.